Jewelry manufacturers can benefit from having Fine Precious Metals Grain and wide variety of quality Master Alloys available all the time. Our goal is to serve the industry with quality products at competitive prices. We produce refined gold with purity +99.99% and silver with purity +99.9%. Quality is always consistent. 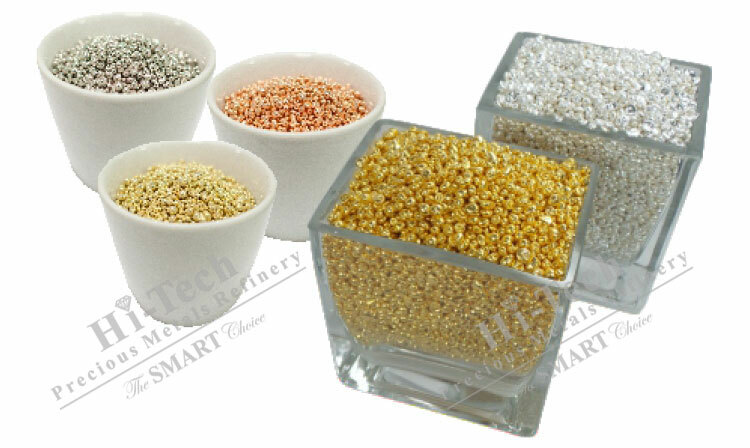 Grain size is the standard small size shots usually used for jewelry manufacturing. We manufacture Master Alloys with superior quality for gold jewelry manufacturing and silver jewelry manufacturing. You can rely on Hi-Tech’s Master Alloys to improve your production quality. We have made wide variety of Master Alloys with ideal formulation that is suitable for all possible jewelry manufacturing needs whether for casting in closed or open systems as well as for Mechanical works. We promise to meet all the new manufacturing challenges and make the perfect alloy for your production. Our proven quality will help to minimize all production issues such as cracking, porosity, tarnishing, and unsatisfactory hardness. Every batch of Master Alloys is made from high-end quality, oxygen-free raw material, produced in strictly controlled processes, and made without lead, cadmium, or any other noxious elements as alloy components. Please view our Master Alloys list. We have made detailed technical guidelines for every Master Alloy item which is always available in the Smart Portal. We look forward to hearing from you to assist you and answer your questions. We happily offer free samples for base metals Master Alloys.